One of the most popular applications for motor drive systems is the process of positioning. There are thousands of applications in manufacturing and packaging where not only must the device or product be in the right place at the right time, but they also need to be in the correct position and/or orientation as well. This is where positioning motor drives systems come into play. There are basically two types of positioning systems. Open loop and closed loop. Open loop means no feedback from the object being positioned; closed loop includes feedback from the object being positioned. Of the two positioning systems closed loop is the more expensive but more accurate type. I explain how the closed loop type works in more in more detail in the AC Servo section on this site. Here we are going to take a look at stepper motor drives, which are accurate enough for many positioning applications. These drives are aptly named because they do not really rotate; instead they step from one position to the next in their 360 degree circle of movement. They are a type of DC motor with many pole pieces on the armature and field so as to be able to break up the circle of rotation into fine segments for indexing purposes. If the circle is broken down into 360 steps and one programs the stepper drive to move 720 steps the motor will rotate exactly for 2 complete revolutions. They also have another property which makes them useful. This is great stopping accuracy without the need for an additional brake system. This is why I used one on the tube filler you see above. After a tube is filled it has to be oriented into the correct position so that the brand logo is facing forward before the end seal is applied. After the tube is filled it is passed to an orienter station where the tube gets lifted up vertically on a little rotating platform. A stepper motor is indexing this platform repeatedly for 360 degrees. A photo eye mounted nearby is searching for a registration mark pre printed on the perimeter of the open end on the tube, Once the eye sees the mark, The tube rotation stops immediately and the tube is lowered back into the tube transport chain where it is advanced to the sealing and crimping station where the end gets closed by a combination of folding crimping and heating to produce a finished tube. 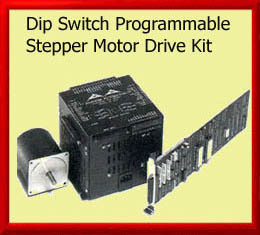 This is a very low level application for a Stepper Drive so I found small Stepper Drive and motor combination made by Anaheim Automation that can be programmed easily by just setting g a few dip switches on the control and you are done They are a great affordable and easy to implement solution for this type of application.